A while back my cousin's husband expressed an interest in warm handknit socks (this is how I interpret his absconding with the ones I knit her, and which miraculously stretched to fit him) so I decided to make him a pair. We all know how that went, right? I knit another pair for her instead and didn't finish his in time to send home with her when she left last weekend. However, I have now cast on his socks. I love, and I mean LOVE this colourway from Twisted Fiber Art. It's called 'Dapper' and it's so perfect and familiar... brown suede and denim is what I think of the whole time I work with it. 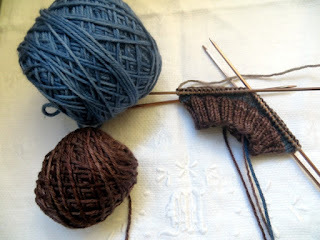 I think he will love these socks, if I have enough yarn to finish them. Because that's the problem here. I only had this one sort of DK yarn on hand to make a comfy pair of socks for him, and I'd already used some of it for socks for somebody else. 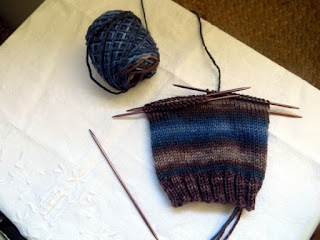 So there's basically enough stripey left in two balls for two sock legs and not much more... hence the brown cuff. 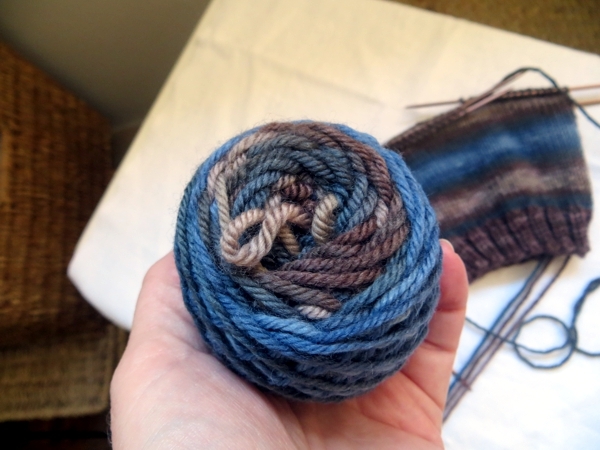 I have to do two cuffs and two heels and probably two toes in brown, and get two feet out of this cake of blue. Can I make this work? I have no idea. I normally knit DK socks with 56 stitches on the needle and that would probably be fine, but these are Man Socks, so I cast on 64. And 8 extra stitches per round is bound to add up don't you think? Oh well, stay tuned - I'm nothing if not persistent! Hope you have a good day and I'll see you tomorrow. Yes, you can make it work! For what it's worth, I think they will look fantastic, not colours I would have put together, but perfect.